If you want to try making your own soap, but feel intimidated, scared or unsure of what to do first, I’ve created the perfect mini course for you! Throughout the series, I’ll also share half a dozen checklists and printables that will be extra helpful as you begin making soap. Check your inbox for an email, asking you to confirm that you want to sign up. Once confirmed, look for the first email in the series to arrive right away! Each day after that, look for a new lesson to arrive around the same time. Once you’ve completed the mini course (6 emails), I’ll keep in touch by sending you new soap recipes & other DIY project ideas two to four times a month. If you don’t see the confirmation email within 30 minutes, check your spam, trash or junk folders, since sometimes good emails get sent there by mistake. If you’re a Gmail user, check the promotions tab. You can also add my email address hello@thenerdyfarmwife.com to your contacts list to be extra sure that you won’t miss any of the lessons or my followup emails. Tagged beginner soap, course. Bookmark the permalink. sounds great to me! Soapmaking sounds like fun, plus…soap! Thank you for sharing your knowledge of soap making because I have been wanting to learn this art and have been reluctant to attempt because of some of the directions I have read about mentioning having certain waste materials after. So it was confusing. I hope these lessons clarifies a few things. This is perfect. I have only made hot process soap because the cold process is too intimidating. Jan, do you have a lip balm recipe that is perfect for men? Something without any shine. Where i live, guys and my sons will not use anything balm with any hint of a shine. It must have beeswax. Looking for a “chapstick” lip balm. Thank you for sharing. I think I have everyting need to make my first soap, I am just nervous. Hopefully your courses will get me over my nervousness. Sounds like fun! Just hope I can get all the oils, I’m in the UK and won’t use Palm, will wait and see! I’m very excited about this. 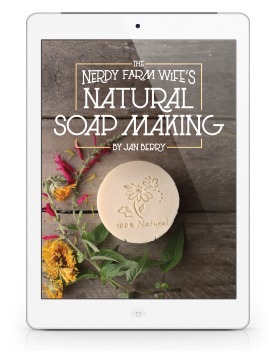 I just bought your book “Simple and Natural Soapmaking” and want to try them ALL . . . a little overwhelmed by which and what to start with. Thanks. Thanks Jan, I’ve learnt so much from your books already, but there is always more to know about soap! Is there a time limit for getting started? I’m not able to give any time to the course for about another week. I am OVERWHELMED by some of the recipes online so very happy to have a basics course. thanks! Ive been contemplating for years. Now’s the time. Thank you. I’ve been seeing Chamomile as an ingredient in a lot of the various product recipes. Due to severe allergies I’m interested in a substitute for it. Any recommendations? Hi I unable submit my email. I have your book “Simple and Natural Soapmaking” and I want to tell you it’s really beautifull. It have so many recipes that I want to try. I write you because I had a problem with the “Cambrian blue cooling salt bars” recipe, sorry I wasn’t sure where to put my question since I couldn’t find any salt soap recipes in your blog. I followed the recipe, but I used green clay instead of the cambrian blue clay and I used lemongrass and rosemary E.O. My bars have about 3 weeks curing and I just tried one bar, my problems is it doesn’t lather at all! maybe salt bars doesn’t lather so much, but my case is really extreme. It was my fist time with salt bars, do yo have any suggestion about what could be the problem? I used organic refined coconut oil from Costco and plain sea salt from my local grocery store. And, do you think I can fix this batch? Maybe rebatching? I was thinking of making another batch without salt and incorporate the salt soap grated. BTW, I made the Pumpkin Oatmeal Soap recipe and that turned out terrific! Hi Angie! That’s great that the Pumpkin Oatmeal Soap turned out well for you! Sorry to hear about the lather issue with the salt bars! With salt bars, it takes a bit to work up the lather; using a bath scrubber pouf/puff can really help too. The added salt will diminish lather, so one thing you could try next time you make this is to reduce the overall amount of salt. Instead of 28 ounces, you could try half that much (14 oz) or even less if you’d like. 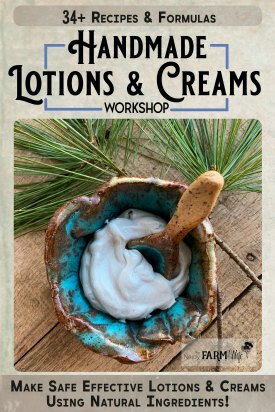 I signed up for this mini course in November, but am just now getting time to ACTUALLY make soap. Im so excited! I know you sent each lesson because I read them when they arrived in my email, but now I can’t find #3 and #6. I probably deleted them by accident. Is there any way you could re-send them? Yay, how exciting! Yes, I’m happy to send you email #3 and #6. I’ll send them over to you right now! Let me know if you don’t spot them in your inbox soon & if they aren’t hiding in your spam/trash/junk folder. where can I get supplies? Hi Margaret! For supplies, you can often find many oils and ingredients locally. You can also check out places like BrambleBerry.com, BulkApothecary.com, WholeSaleSuppliesPlus.com, MountainRoseHerbs.com, NewDirectionsAromatics.com. 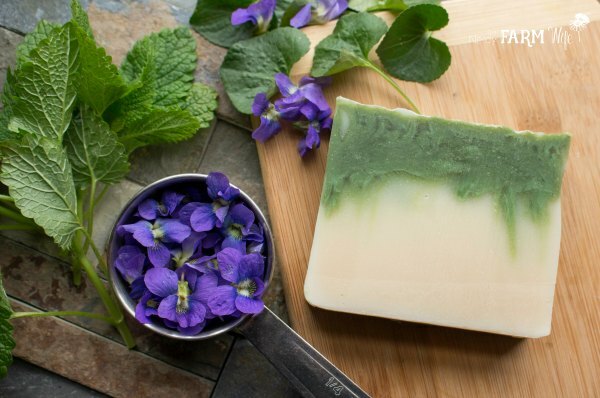 I love the design you used in image for this post!The green melting into the white soap. what is it called? Do you have any tutorials on how to do it? Basically, I poured most of the soap batter in the mold, reserving about a cup or so of plain batter, then mixed in some chlorella powder. Hi Jan! I’ve been looking into starting to make my own soaps for me and maybe others if I have the confidence to! I might very well sign up for this course, but I do have a question. Is it worth investing in one of those soap starter kits that comes with all the basic essentials? By the way, your blog is super inspirational in making DIY soap crafting not seem as overwhelming as I thought it might be!